I work with clay and colour – in that order and equally important. I make a range of ceramic tableware in iconic shapes and forms – each pot uniquely, brightly hand-painted to create a distinct functional piece. I am lucky enough to live and work in Dingle on the Wild Atlantic coast of Ireland, the place I spent idyllic childhood summers, and now my home for over 19 years. Essentially a fishing and farming village, Dingle is full of creative people – and it is an inspirational place for my work. On a good day there is an incomparable lucidity to the light. Anybody who has spent time here knows what I mean. The reds, yellows, oranges and purples of the hedgerows; the sea blues and greens; are vivid and translucent. This is what I put on my pots. The colours of wildflowers, sea, islands, fields, wetlands – Bog Iris yellow, Fuchsia red, Clover pink, Vetch purple, Montbretia orange, Blasket Island green, Atlantic blue… You get the idea. It is impossible not to be inspired by what is around me. I work with clay and colour – in that order and equally important. My style was originally influenced by UK potter John Pollex, himself inspired by abstract artist Howard Hodgkin. I bought one of John’s ceramic pieces, and when I moved home to Ireland in 1996, with an ancient kiln and wheel, my work grew from there. Almost 20 years later, John recently spent a week with me and imparted invaluable practical tuition, inspiring me anew. I think everyday objects should be things of beauty. My pots are the bright, shapely accompaniment to food, drink or flowers on the table. 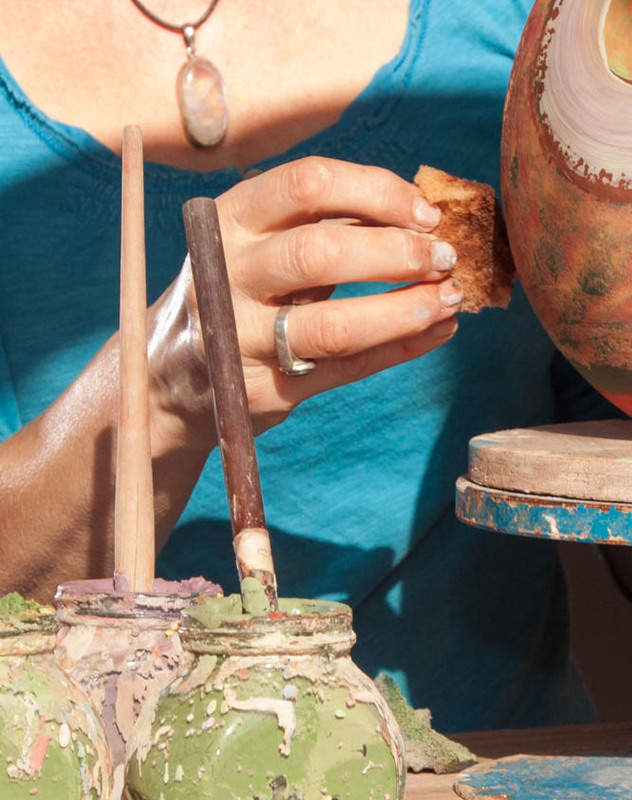 When I approach the decorating of a pot, it becomes more than one piece – every way you turn it, it has a different face: a different personality, pattern and mix of colour. I enjoy the freedom of painting on fine ceramic forms. They brighten my day. I want them to brighten yours. The pots are hand thrown from white earthenware clay and then turned. At the leather-hard stage each piece is dipped in a black slip and then individually decorated with brightly coloured slips, using both brushes and sponges. Following a bisque firing, a transparent glaze is applied before the final firing.